Anshan (Sumerian: 𒀭𒍝𒀭 Anzan), modern Tall-i Malyan/Tal-I Malyun/Tal-e Malyan (Persian: تل ملیان‎), was an ancient city in Persia. It was located in the Zagros Mountains in southwestern Iran, approximately 46 kilometres (29 mi) north of Shiraz and 43 kilometres (27 mi) west of Persepolis in the Beyza/Ramjerd plain, in the province of Fars. It's location serves as a landmark for Elamite studies. It was one of the earliest urban states of the Mesopotamian area and earliest capitals of Elam from the late 4th century. It fell under the rule of the Persians in the 7th century and then became one of early capitals of Persia. Most of what is known about Anshan has been discovered through ancient artifacts discovered in archaeological digs at Tall-i Malyan and passages in early Elamite texts. Anshan is considered to be the origin of one of the world's oldest known civilizations. It was occupied consistently from before 4,000 B.C. to 1,000 B.C. and was politically tied to the Elamites at Susa, as well as the Mesopotamians. It's exact location was unknown to scholars until 1973 when artifacts, uncovered through archaeological digs at Tall-i Malyan, confirmed it's location. Prior to that scholars only knew of it to be somewhere in the central Zagros mountain range. 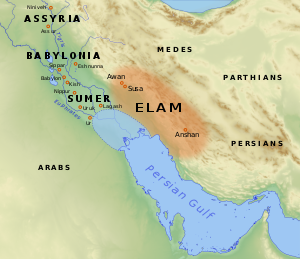 During the Proto-Elamite period (late fourth millennium BC), this becomes one of the main cities of the Elamite region, thanks to its location on important trade routes. During the 'Banesh period' (3400-2800), at 50 hectares (120 acres), it was 5 times the size of Susa. The earliest evidence of Anshan can be found in the Sumerian King list where many references are made to rulers of Awan. Manishtushu claimed to have subjugated Anshan, but as the Akkadian empire weakened under his successors, the native governor of Susa, Kutik-Inshushinak, a scion of the Awan dynasty, proclaimed his independence from Akkad and captured Anshan. Following this, Gudea of Lagash claimed to have subjugated Anshan in 2200 B.C. and the Neo-Sumerian rulers Shulgi and Shu-Sin of Ur are said to have maintained their own governors over the place. However their successor, Ibbi-Sin, seems to have spent his reign engaged in a losing struggle to maintain control over Anshan, ultimately resulting in the Elamite sack of Ur in 2004 BC, at which time the statue of Nanna, and Ibbi-Sin himself, were captured and removed to Anshan. In the Old Babylonian period, king Gungunum of Larsa dated his 5th regnal year after the destruction of Anshan. During the early Elamite period the rulers were known as the kings of Awan, but later on, they are referred to as the kings of Anzan, Susa, and Elam. There is also evidence that advocates Awan may have been a political district that was apart of a larger Anshan.Particularly since it has been discovered that Anshan was politically and culturally advanced. From the 15th century BC, Elamite rulers at Susa began using the title "King of Anshan and Susa" (in Akkadian texts, the toponyms are reversed, as "King of Susa and Anshan"), and it seems probable that Anshan and Susa were in fact unified for much of the "Middle Elamite period". The last king to claim this title was Shutruk-Nahhunte II (ca. 717-699 BC). The site of Anshan covers around 200 hectares. It dates back over 6,000 years and is considered a landmark in both an Elamite studies and Iranian architecture. The main feature is a low flat-topped mound of about 130 hectares running 4–6 metres (13–20 ft) in height. On three sides are the remains of a city wall, 5 kilometres (3.1 mi) in length, which dates from the Late Banesh and Kaftari periods.I Finds at Tall-i Malyan included primarily Proto-Elamite and Middle Elamite cuneiform tablets, seals, and a pottery sequence important to dating the chronology of the region. The site was first worked by Fereidoon Tavallali of the Archaeological Service of Iran in 1961. No records or publications of that effortappear to exist, though some artifacts ended up in the Persepolis Museum. Scientific excavation began in 1971 with a team, led by William Sumner, from the University of Pennsylvania and Ohio State University after a survey in 1968. The dig continued for several seasons, until 1978, when the Iranian Revolution intervened. Most recently, Tal-i Malyan was excavated by Kamyar Abdi in 1999. A further 6 week dig was conducted in 2004 by the Cultural Heritage Organization of Iran and Dartmouth College. The most notable find was that of a building brick found at an unspecified location in Iran in 1971. A photograph was discovered in a French archaeological publication which contained inscriptions from this brick that were key to identifying the lost city.These inscriptions were written in Elamite and believed to be part of a temple built by the Elamite kings to the gods at Anshan. After translating a group of tablets that were found at the Tall-i Maylan site the following fall, Erica Reiner, from the Univeristy of Chicago's Oriental Institute, was able to match these writings to those on the brick. They also matched the writings on tablets discovered by the Pennsylvania team which did, specifically, name Anshan. In 1973, it was confirmed that this site was the lost city of Anshan. Three separate groups of tablets were found by the Pennsylvania team at the site. The oldest group contains seven tablets made of unbaked clay that date back to the third millennium B.C. That set of tablets has not been translated because the writing is Proto-Elamite or possibly a script version of Elamite. The next set of tablets are inscribed in Sumerian and date back to 1800 B.C. These tablets signify a Mesopotamian influence. The third set of tablets are the ones used by Erica Reiner to positively identify Anshan's location .An agreement was made between the researchers and the Iranian government that the Iranian government could choose ten artifacts and the remaining items would be divided between evenly between the two parties. The Iranian government chose to take several of the tablets in their choice of the original ten items. ^ a b c Hansman, John (1972). "Elamites, Aghaemenians and Anshan". Iran. 10: 101. doi:10.2307/4300468. ^ a b c "The Lost City of Anshan". Science News. 103 (14): 220. 1973-04-07. doi:10.2307/3957995. ISSN 0036-8423. ^ Moorey, P. R. S. (2000-01-01). "Excavations at Anshan (Tal-e Malyan): The Middle Elamite Period. Elizabeth Carter". Journal of Near Eastern Studies. 59 (1): 34–35. doi:10.1086/468768. ISSN 0022-2968. This page was last edited on 26 April 2019, at 04:44 (UTC).